For remodeling your house, tools, and Farm Circles, you'll be using gems and ores collected from the Mining Points. In Westown (North) you'll find 4 spots where you can find these construction materials. 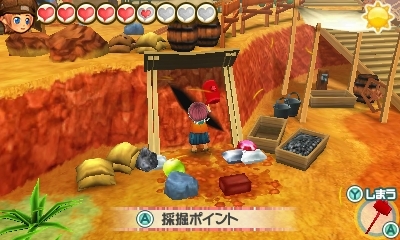 There aren't any Mining Points in Lulukoko Village or Tsuyukusa Town. To collect ores and gems from the Mining Points, stand in front of a point and hit the crack in the wall with your hammer. You will receive a hammer after you remodel your basic farm house, which becomes available on Spring 15 of your first year. Each Mining Point can be hit up to five times per day. Waiting 3 days between mine harvests may result in rarer ores and gems; for example, you might find fewer Pebbles or Scrap Ore just by waiting a few days, but on the other hand you will be missing out on several days of rock harvesting. The items that appear when you hit the Mining Points are determined when you hit them, meaning you can save your game before hitting the crack in the wall . If the items that appear aren't what you are looking for, you can reload your saved game and hit the point again to see if you get different items. Many of the items found at the points can be purchased from the Loghouse outdoor vendor in Westown, although at a high price. Some of the items are possible prizes for winning the seasonal harvest, game, and drink festivals. There is a fifth Mining Point in your underground basement (point #5) once you unlock it later in the game. It produces the same ores and gems as mine #2 on the eastern border of Westown. Your basic hammer is strong enough to hit the points at location #1 and #3, but you will need to upgrade the effectiveness of your hammer to use the other two mining points. Point #4 needs to have its effectiveness at level 2 or higher, and Point #2 requires at least level 3. The only item that can appear from the rock cracks that is seasonal is the wintertime Snowball. All other items can appear throughout the year. Ores and gems do not have Star Rank that would affect the amount of money you earn by placing them in your shipping bin. If you are playing in Seedling Mode, the prices for purchasing ores and gems at Loghouse will be 30% less.